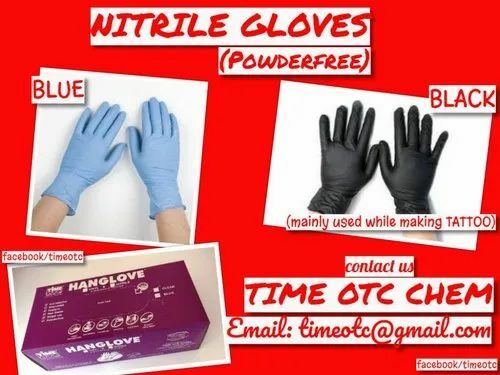 We offer our valued clients Excellent Quality of Nitrile Disposable Hand Gloves. These gloves are manufactured using high-grade latex and effective production methodologies in complete adherence with the defined parameters of the medical sector. Furthermore, these gloves provide complete protection from infection & contamination during surgical activities Furthermore, to cater to the divergent demands of the clients, we offer these gloves in different sizes like Extra small, Small, Medium & Large. We have various packaging available – 2 pcs, 10 pcs, 100 pcs. TIME OTC is active in the field of Home & Health Care Daily-Use Disposable Products mainly in Non-Woven & PE Material. We replace the conventional & outdated Products with Anti-Infective, Safe, Light Weight, Easy to Use Disposables. Pharmaceutical & FMCG and any Factories where Hygiene is valued. Home, Parties, Picnics & Gatherings and many more application. TIME OTC wants to develop 100% hygiene market for India & World and make Quality everyday living with a price every common-man can afford.